Does anyone remember the time boyfriend jeans were a thing? Lately, fashion has been all about the mum jean – vintage mum jeans, fringed mum jeans, acid wash mum jeans, you name it. Topshop tried to introduce the Girlfriend jean a while back but they’ve since renamed it the ‘straight jean’ so I’m guessing that didn’t work too well for them and ASOS even calls their skinny jeans ‘mum jeans’ because it’s cool. However, in a sea of mum jeans, inspired by this Chriselle Lim photo, I did the unimaginable and put my old pair of Zara boyfriend jeans back on this weekend. Five years ago, these were the hottest clothing trend out there – one I was sucked into straight away. The funny thing is they’re 3 sizes bigger because that was the only way I could get them to look like actual boyfriend jeans and they are what I was wearing in my first blog post ever – here. Somehow they seem to not fit me as well anymore, nor go with any of the other items in my wardrobe but I still keep them because of the nostalgia I get when I wear them (usually for a quick grocery run). 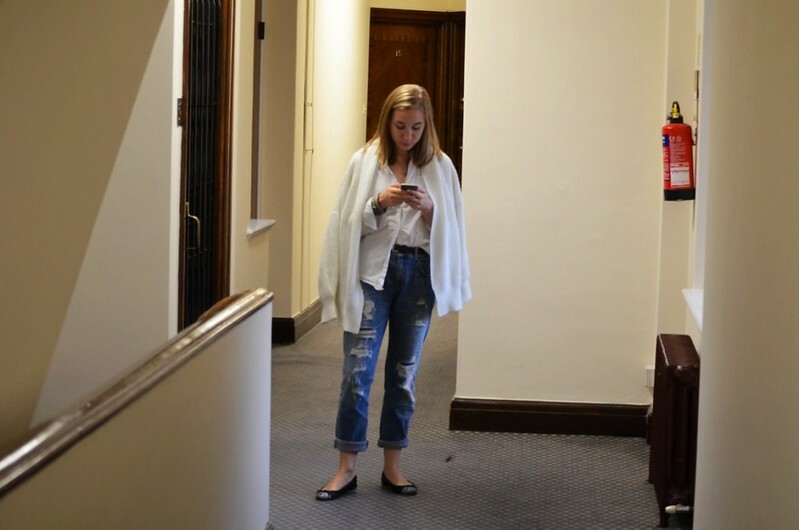 Boyfriend jeans in general give me a very funny feeling – they’re probably the least attractive pair of trousers you are ever going to wear yet they have something undeniably cool about them. No one wears boyfriend jeans anymore (or do you?) and there’s a slight possibility that no one will ever again (or will you?) but boyfriend jeans are a trend that I think will remain in our hearts forever. If you want to bring back the boyfriend jean please let me know how you style and love them and I’m up for writing a petition. You're totalling rocking these loosely fitted boyfriend jeans.